Abstract: MicroRNAs (miRNAs) have been shown to regulate gene expression through both translational attenuation and degradation of messenger RNAs (mRNAs). Though these small noncoding RNAs are predicted to play a signicant role in development, differentiation, and disease etiology, validation of miRNA targets remains a challenge. miRNA mimics and inhibitors are valuable tools for elucidating the roles of miRNAs. Here we have transfected a human liver cell line alternately with a miRNA mimic and inhibitor to miR-122 and analyzed mRNA expression changes by whole genome microarray. By examining the overlap of messages down-regulated by miRNA mimics and up-regulated by miRNA inhibitors, we robustly identify miRNA-regulated messages, many of which have canonical seed matches and some which are not identied by standard target prediction programs.Summary: By examining the overlap of messages down-regulated by miRNA mimics and up-regulated by miRNA inhibitors, we robustly identify miRNA-regulated messages, many of which have canonical seed matches and some which are not identied by standard target prediction programs.References: D. Baek, J. Villén, et al. The impact of microRNAs on protein output. Nature. 455(7209), 64-71 (2008). M. Beitzinger, L. Peters, et al. Identification of human microRNA targets from isolated argonaute protein complexes. RNA Biol. 4(2), 76-84 (2007). G. Easow, A.A. Teleman, et al. 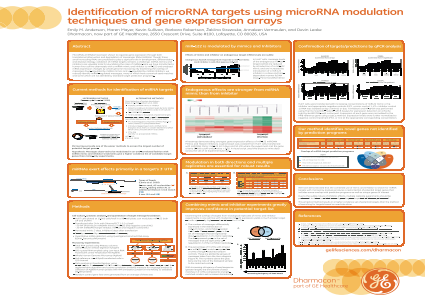 Isolation of microRNA targets by miRNP immunopurification. RNA. 13(8), 1198-11204 (2007). F.V. Karginov, C. Conaco, et al. A biochemical approach to identifying microRNA targets. Proc. Natl. Acad. Sci. U S A. 104(49), 19291-19296 (2007). L.P. Lim, N.C. Lau, et al. Microarray analysis shows that some microRNAs downregulate large numbers of target mRNAs. Nature. 433(7027), 769-773 (2005). F.E. Nicolas, H. Pais, et al. Experimental identification of microRNA-140 targets by silencing and overexpression miR-140. RNA. 14(12), 1-8 (2008).